In a blender combine the lemon juice and oil, blend. Add the mint and basil leaves slowly and pulse until it just comes together. Blend in garlic and salt. Now add the walnuts while pulsing on and off. Put in a jar and mix in the rest of the walnuts. Now use in your pasta, rice or on top of steamed vegetables. 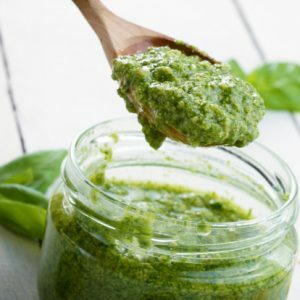 Pesto keeps very well; it is delicious for a few days (mine seems good for at least a week) and it freezes well, too. Note: you can use any type of mint that you want to. It does not have to be peppermint. I use chocolate mint that is growing in my garden. Arugula Pesto Recipe – This arugula pesto is a favourite of mine. Lemon Mint Salad Dressing – This a delicious and refreshing mint salad dressing.